Fireside Recording Studios is just one of dozens of buildings that have been torn down on Music Row. The red X's on the maps tell the story, marking the locations of more than 35 buildings on Music Row in Nashville, Tennessee, that are no more. Clicking the X's and pop-ups will reveal which music-related businesses are gone: Pete Drake Studio; Ariose Music Group, Inc.; and Vibe Studio, to name a few. 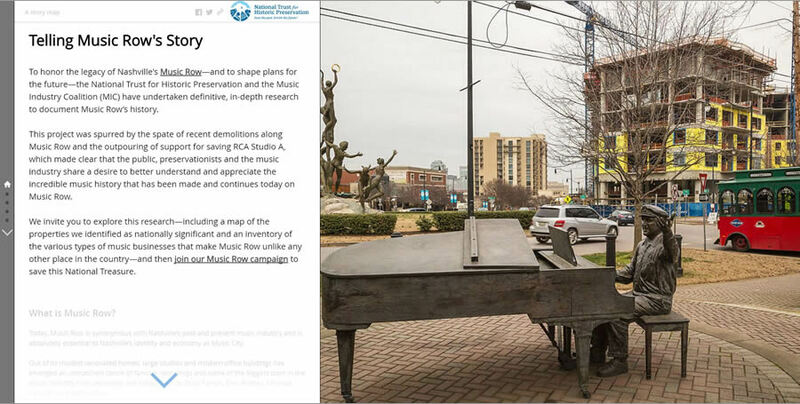 The maps are included in an Esri Story Maps app called Telling Music Row's Story, which chronicles the history, building demolitions, and new development in this unique district in Nashville. Starting in the 1950s, artists and entrepreneurs transformed the residential neighborhood of nineteenth- and early-twentieth-century homes into recording studios and publishing and promotion offices for major and independent record labels. Elvis Presley, Faith Hill, and Chris Stapleton are just a few of the artists who have made legendary music on Music Row. But one by one, many of the music studios and publishing houses have been vacated and the buildings torn down to make room for upscale high-rise condominiums, apartments, restaurants, hotels, and retail stores. The city's growth and gentrification are swallowing up some of the space once occupied by music recording studios or other businesses associated with Nashville's thriving country, gospel, rock 'n' roll, and rhythm and blues scene. The National Trust for Historic Preservation created this Esri Story Map Journal app to raise awareness about the history of Music Row and the demolition of many music industry-related properties in this Nashville district. The photo of the statue of music producer Owen Bradley was taken by Rick Smith. One X on the map marks a building that housed Buckhorn Music Publishing Inc., which once employed Kris Kristofferson. Another casualty was the Boar's Nest, home of the late Sue Brewer, who hosted what the Nashville Songwriters Hall of Fame called "guitar pulls" in her living room. Singer/Songwriters such as Kristofferson and Willie Nelson gathered there to play their music. The National Trust for Historic Preservation recognized the threat being posed to Music Row by development. In January 2015, the trust designated the district as the Music Row National Treasure and launched a collaborative campaign with local partners to preserve the area. Part of that campaign involved creating an Esri Story Map Journal app to tell Music Row's story. "Our key strategies for working on Music Row are to document its history, to raise awareness of the area's significance, and to build support for its future," said Carolyn Brackett, senior field officer for the National Trust and project manager for the Music Row National Treasure. "Creating Esri Story Maps was an effective way to address all of these strategies. Story maps provide a visual record of important music-related resources and show sites that have been lost in recent years to make way for new development." 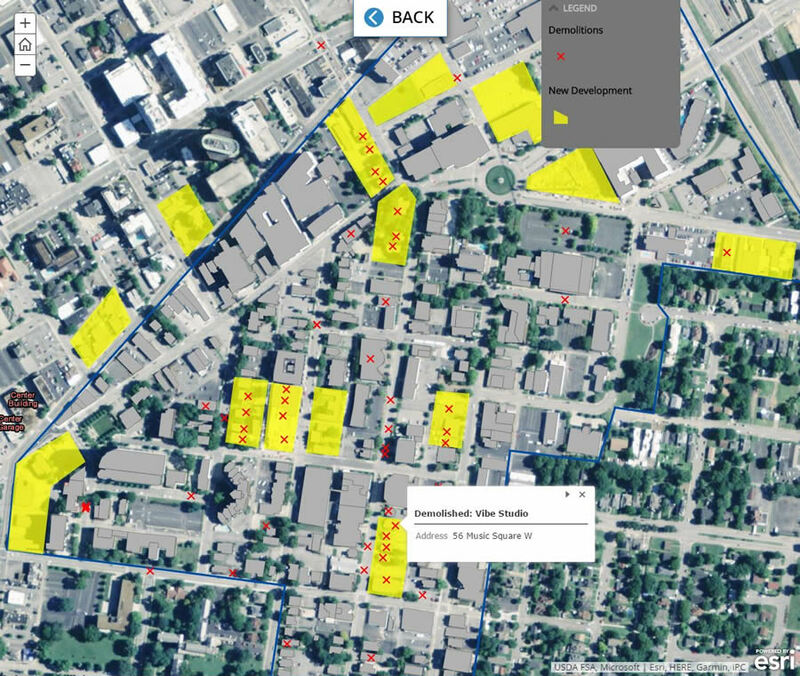 Besides mapping where music industry-related buildings were demolished, the story map shows the properties that are currently listed or eligible for designation on the National Register of Historic Places. New developments, in yellow, are replacing some of the music studios. There have been victories. 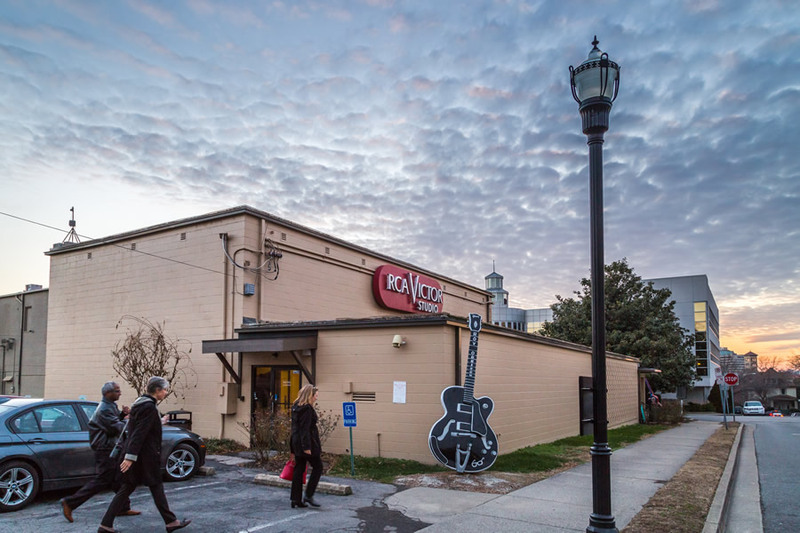 RCA Victor Studio A—an iconic recording studio that was high tech in its heyday 50 years ago and used by many famous singers such as Dolly Parton, Tony Bennett, and Keith Urban—was saved. A half-million-dollar renovation of the building is planned. The Esri Story Maps app was created by two National Trust staffers—GIS analyst Reina Murray and Rebecca Bice, associate manager, Forum Member Engagement—using information gathered through the National Trust's work to prepare a National Register of Historic Places Multiple Property Documentation Form (MPDF) for Music Row. This included creating an inventory of music-related buildings that could be eligible for the National Register. 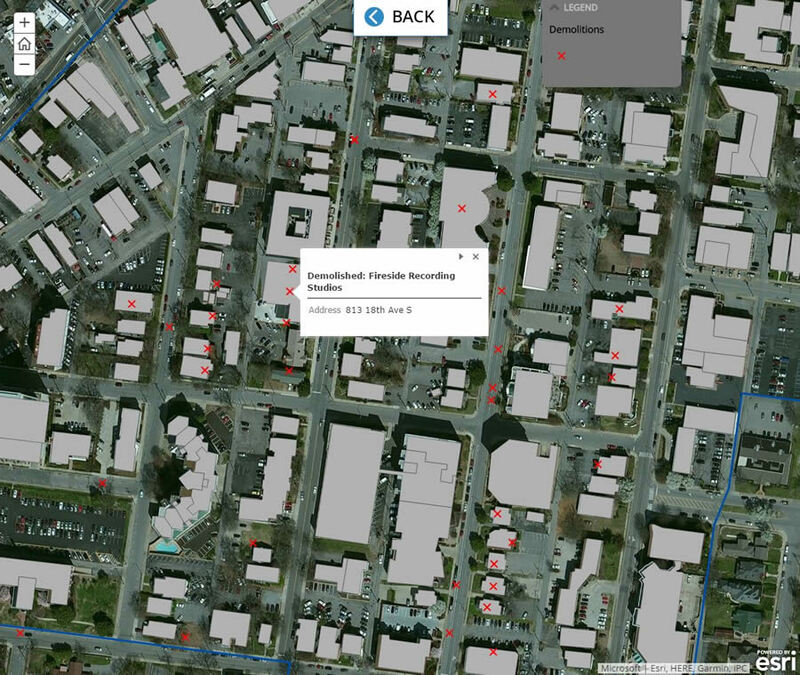 The initial inventory of the Music Row buildings was generated using a KML file containing location data as well as a Microsoft Excel spreadsheet containing attributes. Murray converted the KML file to a shapefile, joined the tabular data from the Excel spreadsheet, and imported these into a geodatabase so that the information was available in Esri's ArcMap application. Murray and Bice used GIS to digitize an existing cultural resource inventory, aggregate additional Nashville data, and produce a story map. 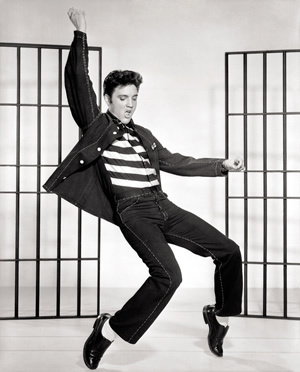 RCA Victor Studio B, seen here in this photograph by Rick Smith, is open for tours in Nashville. The City of Nashville's Metro Planning Department, which uses a GIS platform called MetroGIS, provided a basemap and a shapefile of building footprints for the study area. 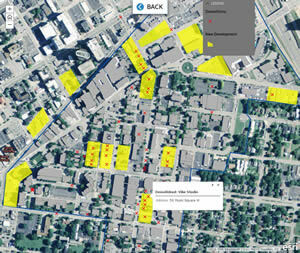 Murray spatially joined the cultural asset inventory and point data layer to the department's building footprint shapefile to create a cultural asset survey map. The final maps visually documented Music Row's legacy by identifying properties that are potentially eligible for inclusion in the National Register of Historic Places. Communicating National Register eligibility to property owners was important because owners can use federal tax incentives to rehabilitate buildings. Moreover, the designation validates a property's significance so that it can benefit from local government policies and support from historic organizations. The final map also conveyed how much new development had encroached on Music Row. The map identified 35 music-related buildings that had been demolished in recent years and replaced with new development. This map made a strong statement about the impending threat to the remaining historical places. Hosted in Esri ArcGIS Online, the Music Row story map is now embedded into the Music Row Stories website. By clicking on a building, map users can learn more about the role it played in the music industry. 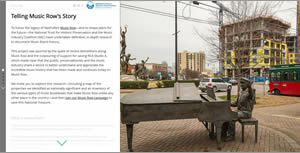 The story map includes an invitation to lend support to the protection of Music Row and provides links to the National Trust's website, SavingPlaces.org, for more information about the campaign. Elvis Presley is said to have recorded more than 150 songs at RCA Victor Studio B. The Music Row story map is a model for other projects at the National Trust. Because the organization's work is place based, the National Trust is making a concerted effort to bring GIS into the heart of its work. In 2015, National Trust created a GIS analyst staff position and hired Murray, who immediately began importing tabular data into GIS in order to map historic locations, National Trust sites, and field offices. "The online platform is an ideal way to display our data and also to overlay and enrich it with additional layers pulled from various REST services," said Murray. "Compelling maps are enhanced by digital content such as audio clips and old photographs. Story maps weave the narrative together beautifully. Story maps are a great tool for us to communicate our projects to our external and internal audiences." In addition to the Music Row project, Murray has applied GIS to other National Trust endeavors including the Historic Properties Redevelopment Program and the work of the National Trust's research division, Preservation Green Lab. "GIS helps us understand our projects and scenarios better and communicate what we know to our audiences," Bice said. 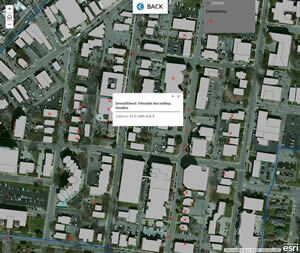 View more Esri Story Maps apps created by the National Trust for History Preservation.